Bird by Bird: In this warmup article I talked about the general philosophy of the defense, 1. e4 e5 2. Nf3 Nc6 3. Bb5 Nd4. Key points in Black’s favor are: It often exchanges off a good White attacker, the KN; it often disables White’s “Spanish bishop” so that it has nothing to do; it occupies the d4 square, and in many lines White finds it unexpectedly difficult to stake his usual claim in the center by c3 and d4. 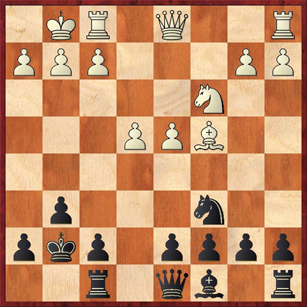 Key disadvantages are that it flouts a well-known opening principle (don’t move the same piece twice); it usually leads to doubled d-pawns for Black; and it sometimes give White the possibility for a kingside attack because of his greater space on that side. Bird by Bird, Part 2: Here I looked at what I call the Egg on Face Variation, 1. e4 e5 2. Nf3 Nc6 3. Bb5 Nd4 4. Nxd4 ed 5. c3? Qg5! I call it that because White will usually retreat his bishop abjectly to f1, leaving Black a tempo up. Of course you can’t build your opening repertoire around a trap, but still it’s nice to know about this line and you will win some games with it, especially in speed chess or against lower-rated players. Bird by Bird, Part 3A: Now we moved into the heart of the series. In the main line, 1. e4 e5 2. Nf3 Nc6 3. Bb5 Nd4 4. Nxd4 ed 5. O-O, I advocate what Michael Goeller pointed out should be called the Blackburne Variation: 5. … g6. White’s most common response is to load up for a kingside attack with 6. d3 Bg7 7. f4. We can call this the f4 Subvariation, or just the f4 Variation for convenience. In this post I looked specifically at 7. … c6 8. Bc4 d5! This counterstrike in the center is essential for Black in virtually all subvariations of the Blackburne. Bird by Bird, Part 3B: In this post I continued looking at the f4 Variation, and considered White’s other bishop retreat, 7. … c6 8. Ba4. This move aims to prevent Black’s normal equalizing move, 8. … d5. The question is, can Black play it anyway? I thought the answer was no. However, one of my readers, James Burke, did some deeper analysis of 8. … d5 that seems to show it’s okay. His (Rybka-assisted) analysis is, in fact, WAY deeper — he analyzes one line out to move 51! I commented on his analysis in Bird by Bird, Part 3C, which “only” goes as deep as move 28. Bottom line: 8. … d5 9. ed Qxd5 10. Re1+ Ne7 11. Bb3 Qd6 looks playable, provided that after 12. 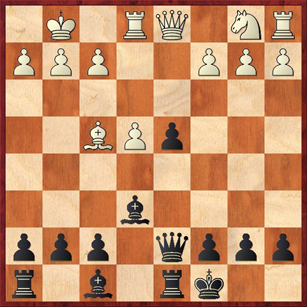 Qe2 Black is willing to sac a pawn with 12. … h5! 13. h3 Be6! 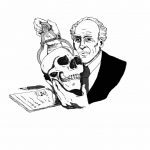 Bird by Bird, Part 4: In another great example of the interactivity of blogs, IM Mark Ginsburg attempted to bust the whole Blackburne Variation (5. … g6). He said that White easily gets the advantage with 6. c3! Bg7 7. cd, and he also suggested 6. c3! Bg7 7. Qa4 as a fun alternative for White. Little did Ginsburg know that he was walking right into my prepared analysis! In fact, I have played against the former line many times, and my key discovery was that Black is doing fine after 7. … c6 8. Bc4 d5! The theme is “blockade first, win later.” Black indeed gets into trouble if he plays 7. … Bxd4? (the only move Ginsburg considered) but by postponing this recapture, he keeps White’s position disorganized. Ironically, White still can’t play his normal move d2-d4 because his own pawn on d4 is in the way! I also discussed Ginsburg’s idea of 7. Qa4, which was played earlier against me by GM Josh Friedel. The theme is the same for Black: blockade first, win later. (A) 1. e4 e4 2. Nf3 Nc6 3. Bb5 Nd4 4. Bc4. (B) 1. e4 e5 2. Nf3 Nc6 3. Bb5 Nd4 4. Ba4. (C) 1. e4 e5 2. Nf3 Nc6 3. Bb5 Nd4 4. Nxd4 ed 5. Bc4. In my opinion the Bashful Bishop Variation(s) cannot be considered as critical a test for Black as either the f4 Variation or the c3xd4 Variation. The reason is simple. 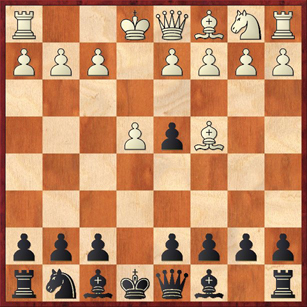 Black has violated opening principles by moving the same piece twice, but with the bishop retreat White “forgives” Black for his sin and in fact commits the same sin himself! What is the point of the Bashful Bishop Variations? 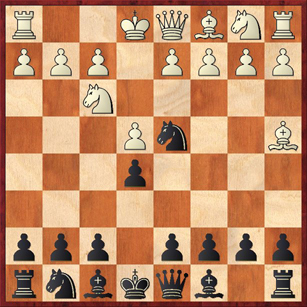 Well, in (A) and (B) it is clear that White doesn’t want to trade his knight just yet, and he is probably hoping that the knight’s attack on the e5 pawn is going to be inconvenient for Black to defend. Also, in (B) White is copying the Rubinstein Variation of the Four Knights Game (1. e4 e5 2. Nf3 Nc6 3. Nc3 Nf6 4. Bb5 Nd4! ?, where White’s best move is supposed to be 5. Ba4), and in fact we could transpose into that variation. Also, a key point in all three lines is that White is trying to discourage Black from playing … c6 and … d5, by creating threats that require more immediate attention from Black. Remember, we saw over and over in Parts 3A, 3B, and 4 of this series that … c6 and … d5 was the main equalizing idea for Black. We will see in my game with Khachiyan that Black does not have time to play the slow Blackburne-type development with … g6, … Bg7, … c6, … Ne7, and … d5. 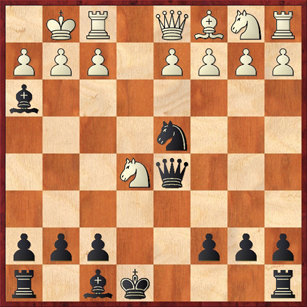 So in all three Bashful Bishop lines I am going to recommend an approach for Black that will create more immediate threats. (A) After White’s 4. Bc4, for some reason I used to play 4. … Bc5 for many years. While this is a book move and should be playable, it was in some sense quite illogical because my favorite defense to the Italian Game (1. e4 e5 2. Nf3 Nc6 3. Bc4) is the Two Knights Defense 3. … Nf6, and moreover on 4. Ng5 my favorite response is the Fritz Variation, 4. … d5 5. ed Nd4. So for consistency’s sake, I should reply with 4. 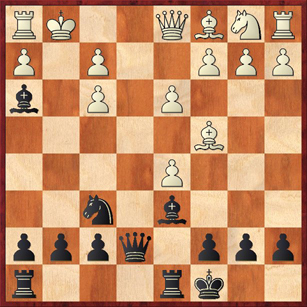 … Nf6!, attempting to steer the game into a Fritz Variation where Black has an extra tempo! A1) 6. Bxd5 Nxd5 7. ed Qxd5 8. O-O … White thinks he is being clever here, defending the knight on e5 by means of the skewer threat. However, before he can get too comfortable Black hits him with the bomb 8. … Bh3! The point is that now White’s skewer doesn’t work! If 9. gh Qxe5 10. Re1 Nf3+! and it turns out that White’s queen is overloaded — it can’t defend both f3 and e1. In the diagrammed position White can fight on with 11. Nf3 O-O-O 12. Ne1, but this is clearly miserable for him. A2a) 6. ed Bd6! Black keeps developing and making threats. White’s knight cannot stay on e5, because if 7. f4 Bxe5 8. fe Bg4 wins White’s queen. A2b) So where can White retreat the knight to? The move 7. Nd3 looks and is ugly. Black can play 7. … b5 (often a useful move, because after Bb3 Black does not have to worry about c3 any more) 8. Bb3 O-O! I admit, this is computer analysis, but it is pretty impressive. Black is in no hurry to win back his two pawns. He simply completes his development, threatens … Re8+, and if White plays 9. O-O? (which ten out of ten humans would do) Black wins with 9. … Bxh2+. Wow. A2c) That leaves 7. Nf3 as the only playable knight retreat. But now White will lose his castling privilege after 7. … Qe7+ 8. Kf1 (or 8. Be2 Nxf3+ 9. gf Bh3). The game might continue 8. … Bg4 9. d3 Nxf3 10. gf Bh3+ 11. Kg1 O-O-O. 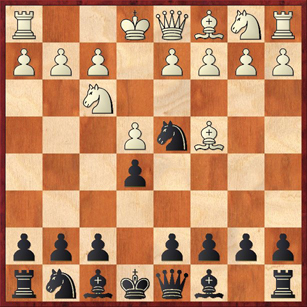 Black’s compensation for the two pawns is obvious. In fact, White is effectively playing an exchange down, because his h1 rook is trapped in the corner by Black’s h3 bishop. On 12. Nc3, the computer recommends 12. … Qe5! with the interesting slow-motion plan of … Qe5-h5-g6, which is unexpectedly difficult for White to stop. A2d) Finally, White can adopt the approach of counterattack, instead of defense or retreat. So after 6. ed Bd6 he could play 7. c3. This is undoubtedly White’s safest continuation, but it also poses Black no problems after 7. … Bxe5 8. cd Bxd4. Black has already won back one pawn and White’s crippled d5 pawn is sure to go eventually. So the conclusion is that Black gets terrific compensation in all lines if White accepts the gambit with 5. Nxe5. I apologize for relying so much on computer analysis, but I have not yet had any chances to test out this variation in a tournament. In all three games where I have played 4. … Nf6 White has declined to test these shark-infested waters. Here I have to hang my head in shame. Black’s best move here is obvious, but the first time I got to this position, against Batsai Tserendorj, I talked myself out of it and played 11. … f5? instead. In fact, I spent 42 minutes on three moves (beginning with this one) and then, not surprisingly, went down to a flaming defeat in time pressure. This is a great example of a phenomenon I have observed many times: My worst moves are the ones I either spend the least amount of time on or the ones I spend the most time on. Black should play 11. … Bf3! here. Of course the bishop is taboo, and meanwhile what is White going to do about the g-pawn? The reason I didn’t play this against Tserendorj was that I didn’t see the followup after 12. O-O. But it’s very easy, and beautiful! After 12. O-O Ne2+ 13. Kh1 Qh3! White can resign! A tougher nut to crack is 12. Kf1, but the computer (again) comes up with a convincing plan. First play 12. … b5, our standard tempo-gaining move to defuse the threat of c3. (Note that 13. c3? here would lose material to 13. … Be2+! 14. Kg1 bc 15. cd Bxd3.) After 13. Bb3, then the stage is set for 13. … f5 14. Ng3 f4 15. Ne4 Bxg2+!, winning. A few months after the Tserendorj game, I got my chance at redemption. The game Kris MacLennan – Dana Mackenzie reached the diagrammed position, and this time I plunked down 11. … Bf3! right away. My opponent played 12. c3, but after this I got an easy material advantage with 12. … Bxg2 13. cd Bxh1 and went on to win. Now let’s go on to Bashful Bishop Variation B, which I will dispose of very quickly. (B) The idea of 4. Ba4 is to prevent … d5 more directly, by pinning the d-pawn. Now if Black wanted to he could transpose into the Four Knights Rubinstein Variation with 4. … Nf6 5. Nc3. But I think there is a much simpler way to equalize, which takes advantage of the fact that we have not played … Nf6 yet. That is 4. Ba4 Nxf3+ 5. Qxf3 Qf6! The point is that Black does not mind trading queens on f3, because it will weaken White’s pawn formation. White, on the other hand, does not want to take on f6 because Black can capture with the knight — developing a piece with tempo. In my experience White will always decline the queen trade, but this means losing a tempo with 6. Qg3 or 6. Qe3. My most recent tournament game went 6. Qe3 b6 7. O-O Bc5 8. Qe2 Ne7 9. d3 O-O 10. Be3 d6 11. Nc3 and here I played 11. … Be6, but I think that 11. 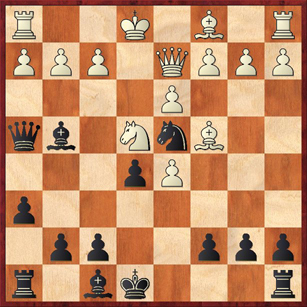 … Qh4 would have been a little bit more accurate (now that White has committed the knight to c3 and can’t chase Black’s queen away with Nd2-f3). The position is about equal, but I went on to win in Luke Harmon-Vellotti — Dana Mackenzie, 2008. (C) And that brings us to the Bashful Bishop Variation Deferred, where White first captures on d4 and then retreats: 4. Nxd4 ed 5. Bc4. As before, White’s goal is to keep Black from playing … d5. First I’d like to show you a downright scary game that shows how bad things can get for Black if he simply drifts along without taking energetic action. Against GM Melikset Khachiyan, I played my usual Blackburne Variation setup with 5. … g6? 6. c3! Bg7 7. cd Bxd4. 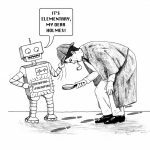 Those of you who have read Part 4 of this series should already be receiving distress signals. This is exactly the way that IM Mark Ginsburg wanted to bust the Blackburne Variation. But in the line he suggested, Black had the “first blockade, then win” strategy with … c6 followed by … d5. But here Black does not have that option! Because White’s bishop has already left the house, 7. … c6 would threaten nothing, and so Black is forced to play 7. … Bxd4. This move almost always works out badly. Khachiyan continued in effortless style with 8. O-O Ne7 9. Nc3 O-O 10. d3 Nc6 11. Bh6 Bg7 12. Bxg7 Kxg7 13. d4. This position is an absolutely textbook example of what Black does not want to happen in the Bird Variation. He has failed to keep control over the d4 square. Not only that, he is still a couple moves away from finishing his development, and his kingside is made of Swiss cheese. I’m sure it will come as no surprise when I tell you that Khachiyan smashed me in 28 moves. In fact, variation (A) could also have transposed to this position, after 4. Bc4 Nf6 5. Nxd4 ed, so this is a line we have to look at anyway. So far I have very little tournament experience with this, in fact only one game. The position sort of resembles a Max Lange-type position, but with certain weird differences. A pair of knights has been exchanged, and there is a pawn on d2 where there shouldn’t be. I think that both of these factors work in Black’s favor. After 6. O-O (6. e5?! d5 should be fine for Black) Nxe4!? the computer recommends the scary-looking 7. Qh5!? Ng5!? 8. f4 Ne6 9. f5 g6!, which it says is equal. I have absolutely no idea what is going on here, but the last few moves look a lot like computer moves, not what real humans would play. My only game against a real human insteaed went 6. O-O Nxe4!? 7. Re1 d5 8. Bxd5 Qxd5 9. d3 Be6 10. de Qd7 11. Bf4 O-O-O =/+ (Sean Higgins — Dana Mackenzie, 2005). This is an example of a Bird Variation that has gone really well for Black. He still has his cramping pawn on d4, powerfully supported by the queen and rook. He has caught up in development, and he has the two bishops, which both have nice diagonals available to them. Finally, his king is relatively safe on the queenside. (It will be hard for White to open lines with c3 because Black can push his pawn to d3.) I eventually won this game, although because of mistakes in the middlegame and endgame it is not really a good instructive example beyond this point. For those of you who like PGNs, you can get a PGN file with all of the above analysis, and a lot fewer words, here. It was my original intention to have one more part to this series, where I would look at random and unusual lines for White. When you play a somewhat offbeat variation like the Bird, some opponents will respond by trying to make it even more offbeat. However, because those games are such a grab bag, it is difficult for me to come up with useful general comments. So I will have to leave it to you to figure out what to do against such lines as 4. Nxd4 ed 5. Qh5? !, or 4. Nxd4 ed 5. O-O g6 6. c4, or 4. Nxd4 ed 5. O-O g6 6. d3 Bg7 7. a4? !, all of which have been played against me in actual tournament games. I hope you’ve enjoyed this series! Sorry that it took me so long to finally bring it to a conclusion.